I’m back at my favourite hawker centre with the husband! There’s this indescribable charm to the whole Tiong Bahru Market environment that always makes me want to come here and eat and whatever food I order can just easily put a smile on my face and makes me go ‘hmm hmm’, lol. Anyway, we were here on a quiet weekend late afternoon. I wanted to order teochew kueh but the stall I wanted to try wasn’t open and we only saw this which was similarly a snacky type of food. 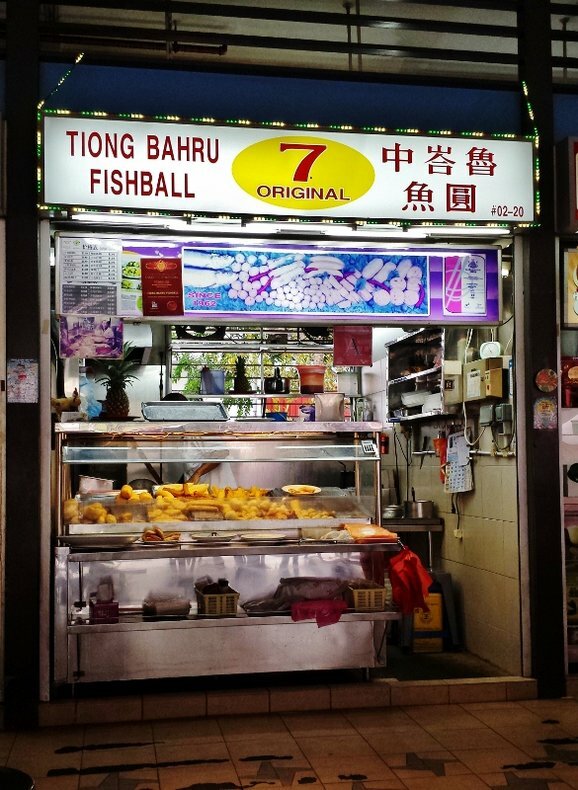 Really, where else can we find a cooked food stall that only sells fish balls and related products? This is definitely the only one I’ve come across so far. Pretty much like a ‘wu xiang xia bing’ (assorted rolls & prawn fritters) stall where you just pick whatever you want and they will fry them up in oil and serve to you piping hot and crispy. And since there weren’t any other customers, I was making small talk with the boss just to find out what each and every item here was (besides the obvious fish balls or fish cakes of course). 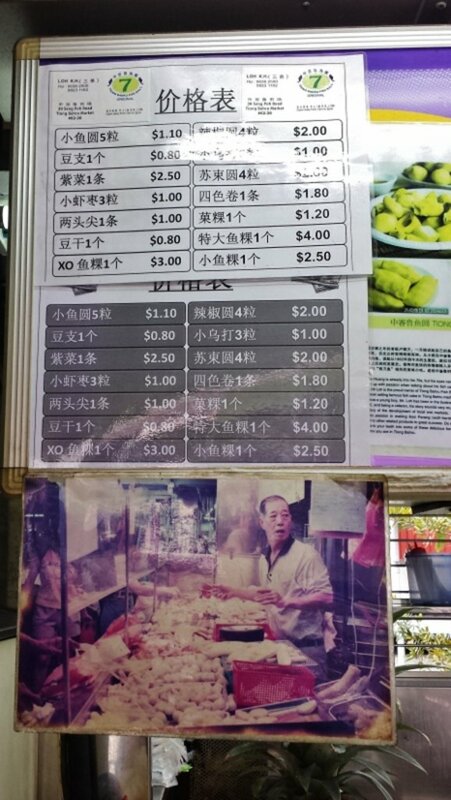 This is the price list and I couldn’t help but marveled at the old picture as I supposed it was stuck up there just to show customers the ‘history’ of the stall, lol. Must had been a really special moment for him! 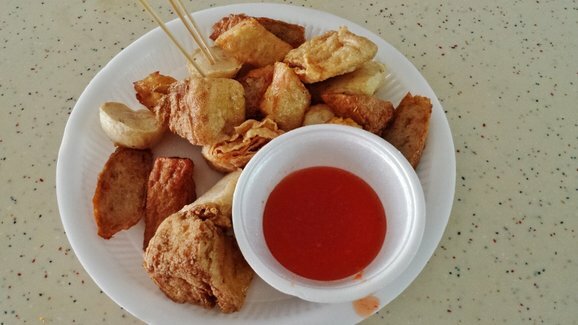 This plate of 2 sotong balls, 1 fish ball, 1 piece tau kwa (firm beancurd), 1 piece ngoh hiang (five spiced meat roll), 1 piece fried beancurd skin and 1 water chestnut fish cake cost $6.60. Well, I wouldn’t say this plate was spectacular as you know these were pretty much standard fried stuffs but they did make an enjoyable snack (if you like fried food of course) for that peckish moment. Everything was fried on the spot and served steaming hot and the oil used was also fresh as I couldn’t detect any off ‘re-used’ oil smell. Of everything, I enjoyed the fish ball that was springy and the beancurd skin that was fragrant and crispy. The rest were quite mediocre. The chilli sauce tasted a little too sweet for my liking but anyway the items were already well seasoned so there wasn’t a need to dip them in chilli. 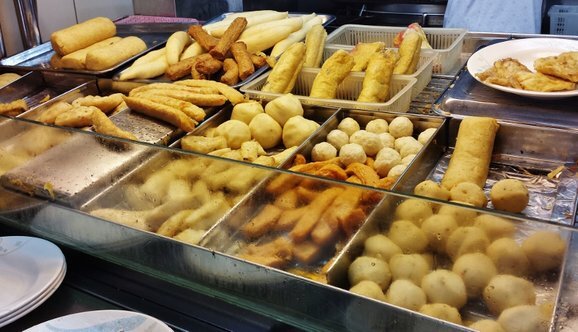 If Old Chang Kee is getting a little boring for you now, why not give this stall a try?